Attending the International Conference on Cancer Nursing (ICCN) 2017 was a great opportunity for me. I thank the International Society of Nurses in Cancer Care for giving the scholarship to me which enabled me to attend the ICCN 2017 in Anaheim, California from the 9th-12th of July 2017. To be part of this conference allowed me to meet experienced nurses from different parts of the world and get to know about the oncology nursing role in different settings. During the congress I presented the work “Assessing the effectiveness of urea cream as a prophylactic agent for radiation dermatitis” in the oral modality. The presentation room had other speakers with works in the same theme. This moment allowed to share our studies, to know the interventions evaluated in other centers of studies and to discuss about the practices adopted for the care of the radiation dermatitis. The presentations were chaired by the Nurse Pauline Rose, of Australia, who led the way enriching the discussion. The existing demands in the field of oncology nursing require an international collaboration among oncologist nurses, aiming to disseminate best practices and evidences between different countries and scenarios of professional performance. Developing or underdeveloped countries need this exchange of knowledge and support from other countries so that care for patients is equally effective. In addition, the development of research should be viewed globally, increasing the scope of the practices evaluated. In this way, knowing the different researches that have been developed and exchanging experiences with researchers who studies subjects similar to mine increasing the networks of studies, the partnerships and the knowledge acquired. It will be very important for me and my institution to know more about the research and ideas being developed and presented by oncologist nurses around the world. I was privileged to be part of the conference. During the conference I had the honor of personally meeting an important co-author, Dr. Raymond Chan, of an article that had been published in partnership with the study group of which I am a member. I look forward to work together with oncology nursing experts from across the world. I’m sure the experiences at the conference will influence my future research. I look forward to continuing to share experiences and having the opportunity to learn more and more with experienced oncologist nurses. The advancement of oncological nursing depends on these collaborative working relationships, in which professionals can train themselves by enabling the development of quality care for all patients, based on the best available scientific evidence. Lastly, I am very grateful to be a participant at this very important conference. I thank my supervisor, Dra. Paula Elaine Diniz dos Reis, a Professor of Nursing at the University of Brasília, Federal District, Brazil, who encouraged me to join the conference. For sure, the experience was incredible and very enriching. 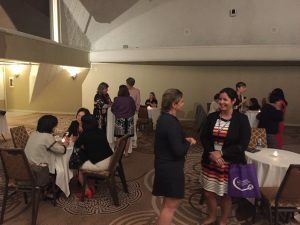 Photo: Elaine Barros Ferreira (in the striped dress), is pictured speaking with a colleague at the President’s Social at ICCN 2017.